I met two other Scooters just like mine! One I met in town (she was traveling on another ship) and the other I met on our ship. 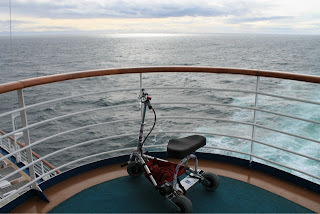 The gal on our ship - the one with the exact same scooter, the one with bad knees and a lung problem, the one who uses a cane and supplemental oxygen (and I'm not talking about me) - is a traveler. 29 cruises to date. She has four planned for just this year. That meeting gave me hope. Hope that I can continue to live life fully despite the limitations I have going on. No need to sit around feeling sorry for myself. In fact, just last night hubby said he was proud of me. Proud of me for getting out there and living life. 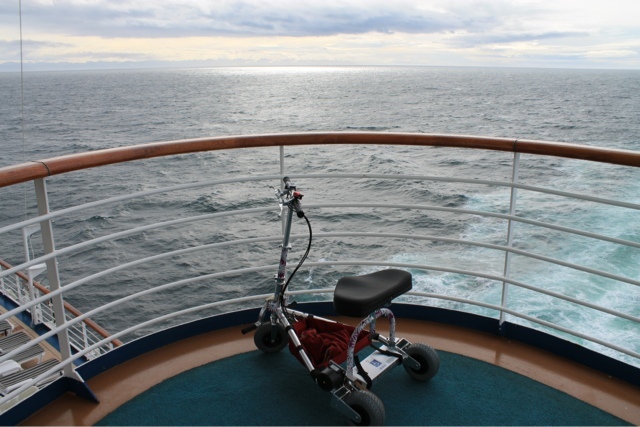 Not many people with lungs like yours would go on a cruise, let alone do everything you've just done, he tells me. Heck, if Scooter likes driving me into town for Thai food over nothing but bumpy wooden walkways (ouchy on the rump), loves hanging out over the edge of a cruise ship ledge, and has fun going down (not so fun going up) the ramps to see Multomah Falls who knows where she'll take me next!